Let’s face it. Macaroni and cheese makes most people happy. It really doesn’t matter how old those people are. It’s just a happy dish and it’s tasty. Mac and cheese = tasty. Small things also make people happy. Mini cupcakes, muffins, petits fours. People think they are cute. Mini things = cute. So what we have here is tasty and cute. It could be worse. If you want to have a guaranteed hit on your party menu, make these little guys. The look on people’s faces as you pull them out of the oven (that combination of “that smells so good” “they are so cute!” and “mac and cheese!”) is priceless. I would make these for every single event I do, but they really need oven time right before serving. Sometimes I am catering a party where that is not an option, so they don’t appear on the menu. I have made them a few hours in advance and then just reheated them right before party time. It works but they really are best if you bake them off just as guests are arriving. This recipe calls for good old American cheese slices presumably for their melt-ability. This last time, I went for the more “natural” version – Horizon brand – and I have to tell you they were better with the cheap stuff. Just like you want to bake with Jif rather than an all-natural brand of peanut butter, you want to make these with Kraft rather than the all-natural. Preheat the oven to 425°F. In a large saucepan of boiling salted water, cook the macaroni until al dente, about 5 minutes. Drain, shaking off the excess water. Spray four 12-cup nonstick mini muffin tins with cooking spray. Sprinkle with 2 tbsp. Parmesan. In a large saucepan, melt the 1½ tablespoons of butter. Whisk in the flour over moderate heat for 2 minutes. Whisk in teh milk and cook, whisking, until boiling, about 5 minutes. Add the Cheddar and American cheeses and whisk until melted. Off the heat, whisk in the egg yolk and paprika. Fold in the macaroni. Spoon slightly rounded tablespoons of the macaroni into the prepared muffin cups, packing them gently. Sprinkle the remaining 2 tablespoons of Parmesan on top. These are adorable. Would it be too bad if I ate 10 of them? I’m a sucker for both mac and cheese and mini things! My fiance and I would devour these in no time. I bet they’d even be tasty cold as leftovers! These are so cute! They would make perfect appetizers! And, speaking of appetizers… I host a monthly cooking challenge on my site and this month’s theme is apps. If you’re interested, I’d love to have you submit this recipe for the roundup! You can get all of the details from the Kitchen Bootcamp section on my site. I’ve so been craving mac and cheese lately! And these are just too cute! Mac and cheese definitely always for sure makes me happy. I remember on the lucky days that my mom made it…from scratch – ALWAYS from scratch…how overjoyed I was. I probably would have eaten the whole pound of pasta if she’d have let me. Thank god she didn’t let me. I love that these are bite sized. 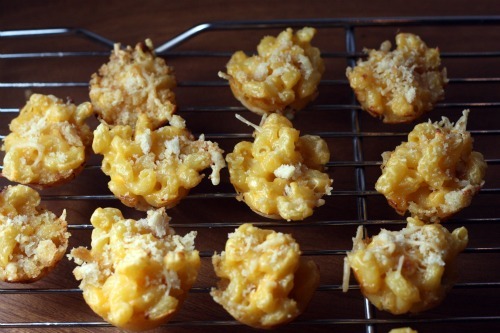 A great way to get your mac and cheese fix but not totally overdo it. Until you eat ten of them. And in response to your comment on my Asian noodle salad – I’ve been trying to expand my nut butter horizons and had cashew butter on hand. I think it’s 100% likely that peanut would taste equally delicious. Utter genius!! I’m assuming this could be adapted for regular-size muffin pans, perhaps with a few extra minutes of baking time? Can’t wait to try them! YUM!! Oh how I loved these. I have actually dreamed about them. man oh man oh man. lil bites of pure crack. how many of these would i eat? dangerous. these are dangerous. but i love em. Those would make me very, very happy. 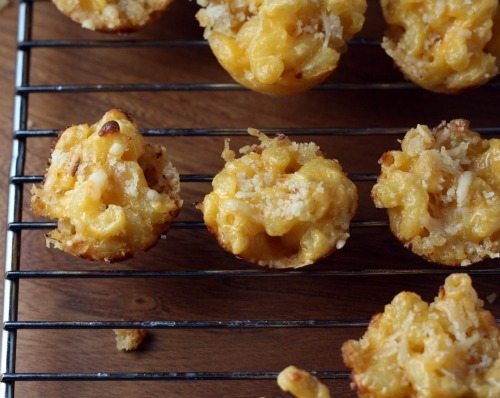 Mac and cheese always does, but add a cute mini size to the mix? Recipe for elation. I am so excited for these Dana! I am planning 2 parties at my house in the coming weeks & have been jotting down ideas for easy finger food. These are PERFECT!! Dana, these are adorable. And so innovative! You really are the queen of appetizers, are’t you? This is such an ingenious way to serve Mac. Looks good. These look amazing! I cannot wait to make them for my cousin coming into town next week for our Misfit Thanksgiving. I can just see myself popping these little bits of LOVE one right after the other! For sure going to bookmark this yummy recipe! I used this recipe at a recent party, and they turned out great! Linked to you from my blog. Thanks for sharing your recipes!